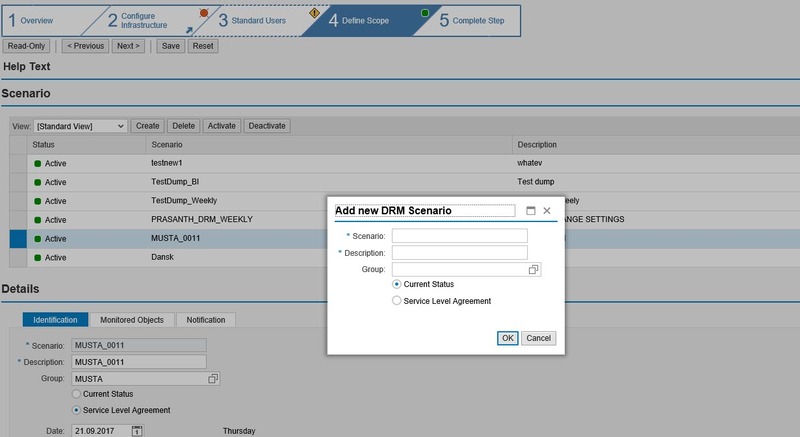 Data readiness monitoring in SAP Solution Manager provides you with the overview of whether the data is available at the intended time. 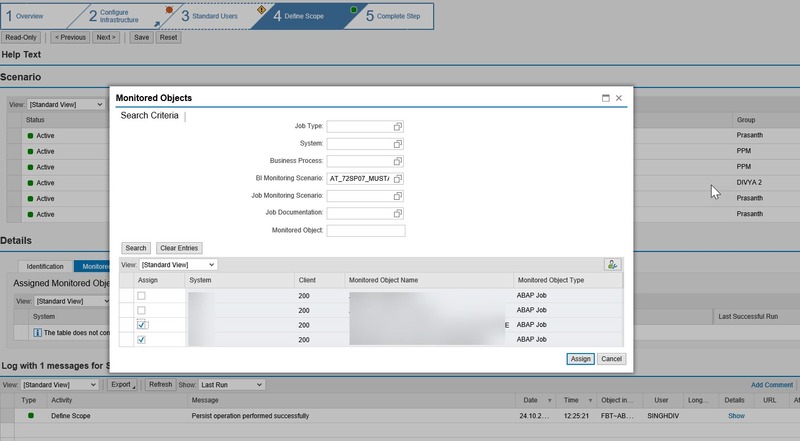 Fiori Launch Pad->SAP Manager Manager : Configuration -> Configuration All Scenarios. 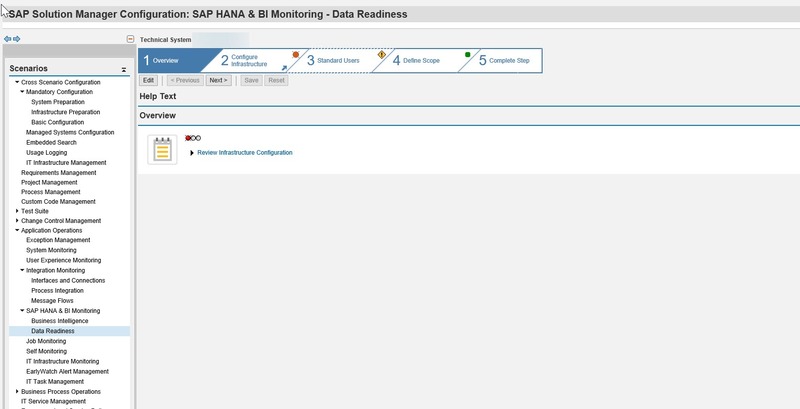 Navigate to Application Operations-> SAP HANA & BI Monitoring -> Data Readiness. Step 2 is necessary to check the infrastructure and complete the pre-requisites. Step 3 creates the standard users for using the data readiness monitoring. Step 4 is the Define scope step you create a new scenario and associate the different monitoring objects. The CREATE action will Add a new scenario. It’s also possible to associate this scenario with a GROUP which can be a logical collection of scenarios. Current Status – The availability of the scenario at any given point in time. Service Level Agreement(SLA) – The availability of the scenario based on date and time. The Service Level Agreement can be further based on the recurrence pattern of – Daily, Weekly and Monthly that allows different possibilities of setting the ranges. Different types of Monitoring Objects can be assigned to the DRM Scenario from either Job monitoring, BI monitoring or Business Process Contexts. Whether to consider the number of successful runs or last run in the evaluation. The activate action will trigger the data collection for the configured DRM scenario. The deactivate action will stop the data collection for an already activated DRM scenario. No more values will be reported on the monitoring screen. The Delete action will deactivate and delete an existing DRM scenario. The Data readiness monitoring is integrated as part of the BI monitoring screen. This means that there is no separate application for DRM, but the monitoring is part of BI monitoring application. Work centre – Go to System and Application Monitoring Work centre -> Navigate to the view ‘HANA and BI monitoring ‘. Navigate to tab ‘All DRM Scenarios’. Select one of the scenarios and Click on Data readiness Monitor button. Note the query already has the rated information of Current status, Service level agreement and First availability per scenario. The monitoring application shows the number of monitoring objects, the number of systems involved and the summarization of different statuses per rating. SLA status – The rating to indicate whether the service level agreement has been met or not against the information that was set up in configuration. 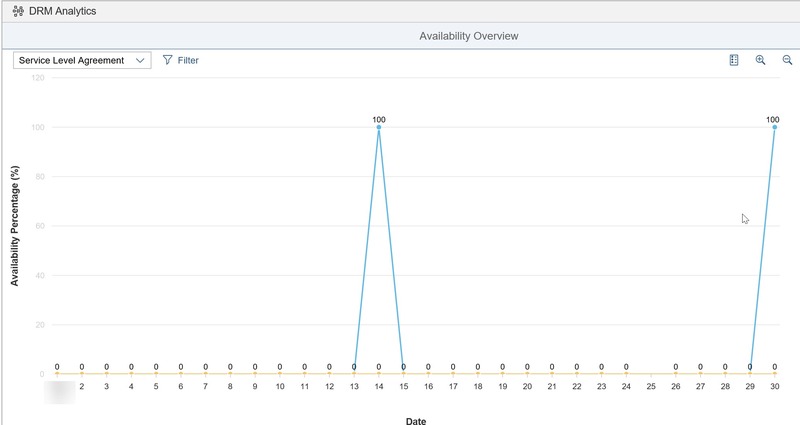 First availability – The information on when the scenarios have all the monitoring objects turning GREEN. In other words, when the data was first available for use(or reporting). The detailed information for each of the statuses shows the information about the different monitoring objects that are part of the scenario and when the data was first available for use. It is possible to overwrite the ratings of the system that are calculated by the system. For example: When the system is down. In this case, the comments and the details of the user are displayed as additional information. First Availablity for the selected Scenario(s). Service Level Agreement for the selected Scenario(s) or Groups.